Pueraria Mirifica Pueraria Mirifica is a plant that grows at high altitudes in the North of Thailand, in Thai the plant is called White Kwao Krua. The Pueraria Mirifica plant has very powerful estrogenic effects. In Asia it is used for centuries as an anti-aging remedy. Also Pueraria Mirifica is well known for natural breast enlargement and breast firming. The Phytoestrogen compounds have positive effects on treating osteoporosis, prostate cancer, reduction of the menopausal syndrome and prevention of hormonally based cancers. Phytoestrogens are not hormones, but they provide the same benefits as estrogen which is the body's primary source for breast enlargement. Phytoestrogens maximizes the blood flow and estrogen distribution through the breast tissue. Your breasts will get bigger and firmer. Pueraria Mirifica increases the fatty tissue around the breast. Pueraria Mirifica supports collagen which gives your breasts a soft but firm natural shape. After starting to use the Pueraria Mirifica capsules results will show after 2 - 4 weeks depending on the quantity of tissue in the breasts. The maximum increment of the breasts will be achieved after 3 months of using Pueraria Mirifica. Increases of breast size from 1 - 3 inches are possible. If one stops using Pueraria Mirifica completely, the breasts will return to it's old shape again over time. If you want to keep the increased size and firmness of your breasts you should lower the dose from 1 daily to 2 - 3 per week. If you want faster results, you can combine taking the capsules with using Boom Breast Cream, also made from Pueraria Mirifica. WARNING: Pueraria Mirifica should not be used by woman under 20 years of age as the body is not fully grown yet. Also pregnant woman should consult their doctor first. Please follow the dosage on the package. Some other benefits of the Pueraria Mirifica herb: - serves as 'fountain of youth' - darkens grey hair and helps increasing hair growth - increases energy levels and vigor - better blood circulation - diminues sleep problems - it will help your skin to look smoother and younger Advised dosage is 1-2 mg/kilo per day. Example, if you weight is60 kg, you daily dosage is maximum 60 - 120 mg/day. These capsules contain 100 mg Pueraria Mirifica per capsule. If your weight is over 75 kilo, you should consider to take our other Pueraria Mirifica capsules which contain 150 mg Pueraria Mirifica per capsule. I Received my products today after a week. Thanks for the fast delivery. I read about this product from a blog written by a women engineer from Malaysia, initially I thought she was selling the product that is why she had given a good review, but eventually I found out that she was only a user and she had wrote a very professional review. I thought why not try to purchase the product for my wife. Within short period of time I had received the product and within a very short period of time also the product had deliver its promise to its customer. I'm very happy with the result and was quite surprise with the quality of the product especially with the reasonable price and offered by Thai Herbal Products (THP) compare to the much more expensive product that had been purchased before but with no result. Furthermore the product is GMP, HACPP and Halal certified, so what more can you expect? Thank you THP, will surely continue my purchase in the future. You've got to try it to believe it!! Read many good reviews on this product but not until I bought and try it, did I believe that this product work wonders!! Hubby even complimented on its effectiveness and as for me?... Im feeling the difference and am for sure gonna continue taking it in the long run! Firts trial in feb 2015, i buy 2 bottles. I take the firts bottle daily for 2 months, then my size up from 32b to 34b++.. The secon bottle i take only for maintained. I'm looking to improve more size,, im going to buy again. Wish this help and works for you too. Dont lazy to massage you breast too. Good luck! I've always had irregular periods. Ever since i started consuming thanyaporn my periods have been very regular! & my breasts feel firmer. I'd buy recommend it to my girlfriends which i already did. hi.i ve been using it for about one month but havent seen any change! should i be hopeful i ll see the results after 3 months? ?im 60 kilos.one capsule a day is enough?? Q: hi do you ship to sg? A: Yes we ship to Singapore with registered airmail. We ship worldwide only not to Germany and Italy. Q: Hi... can you ship to singapore? A: Hi, we ship worldwide to your house, so also to Singapore. A: Yes, we ship to Singapore, to your house with Thailand Post registered airmail. It takes 7 - 10 days to get to you. Q: Do you ship to Brunei? A: We ship worldwide to your doorstep so Brunei is no problem ! Q: I received my thanyaporn today and is soooooo eager to try it out. My question is can I take a dose after any meal of the day or do I only have to take it after breakfast? Cos I don't usually take breakfast, I go straight to lunch at mid day. A: There is no problem to take it after lunch, just take it around the same time every day. Q: My question is mainly about the effect of this product on balancing female hormones. Is this product mainly for perimenopausal and/or post menopausal ladies or can the ladies in their early twenties having a problem with hormone balance use this as well? Many thanks. A: Pueraria mirifica is a source of bio available phytoestrogens for premenopausal and postmenopausal women. Phytoestrogens are plant compounds that mimic and support human estrogens. Numerous studies point toward their inhibitory effect against breast and prostate cancer. Pueraria Mirifica strongly helps to balance the hormones for women. Q: Hi dear, ive heard good reviews about this product..May i know if the Thanyaporn capsule 150g are safe for a 20 yr old female? hope to hear from you soon. A: Hi, yes it is safe for everybody from 19 - 20 years. Most important is that the breast have stopped growing naturally. Than you can use Pueraria Mirifica. It's all natural so if you need faster results you can also take 2 capsules per day. Q: My weight is 45kg n im 39 years old can i take this product? A: Dear, yes if you're 39 years old an 45 kg you can use Pueraria Mirifica from Thanyaporn Herbs Thailand. Q: How long will it take to show effect? A: Typically it takes around 2 - 3 weeks to show effects but it can be a lot faster though. Q: U said that thanyaporn pm is halal and has HACPP approval. But how come there is no label on the bottle to state so? If true it is halal and approved safe for consumption then can i view the certificates? 2. Does thanyaporn has any synthetic hormon in the pm capsule? What is the capsule made from? A: There are some issues with the body that has to issue HALAL licenses in Thailand. We are manufacturing 100% following HALAL but as we are awaiting the official approval we cannot use their Logo on our products yet. All ingredients, capsules, manufacturing process are HALAL and natural, so there are no animal products or hormones used. Q: Can breastfeed mum consume this product together with garcinia cambogia? A: We don't advise to use Garcinia Cambogia during breastfeeding. Q: There are many fake product thanyaporn in the market...would u like to share with us, how to know which one the original thanyaporn??? A: The only way to make sure is to order from our online shop on http://www.thaiherbalproducts.com or from our 'ThaiHerbalProducts' shops on eBay or Amazon. Q: Hi..my weight is approximate 50kg (it fluctuates).should i take 100mg or 150mg capsules? A: Thanyaporn Pueraria Mirifica capsules are all natural and don't contain hormones. Many users will take 2 -3 capsules per day to speed up the process. You can use 150 mg capsules without any problems. Q: Hi! I've bought Thanyaporn and would like to know if it is safe to consume it during my menses? A: It is advised to stop taking Pueraria Mirifica during menstruation and start taking it again after menstruation stops. Q: May I know that how much is the shipment cost to Malaysia? A: Shipments within Asia countries is typically 6 U$ for the 1st product and 2 U$ for every next product. The 1st product is pretty expensive as we need to send with registered airmail. Q: Is there any food restrictions to be followed while taking this tablets? A: HI, there are no restrictions for food to be taken with Pueraria Mirifica, you can just keep your regular diet. Q: Hi, if i currently consuming collagen drink, to be exact 'collagen drink', can i still consume thanyaporn? is there any side effects? A: Hi, there is no problem in using Thanyaporn's Pueraria Mirifica as it is all natural and does not have any side effects. Q: may i know, is it safe & enhance our reproductive system as im also trying for baby? A: Pueraria Mirifica can also increase the change of getting pregnant. Q: If i hve satisfied with my breast size , can i stop completely using this this product ? Or there will be any effects ? 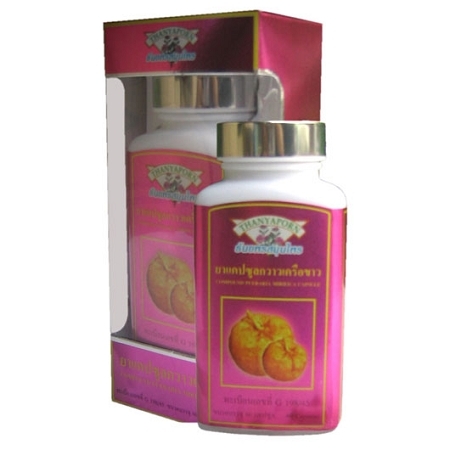 A: We're happy to hear that Thanyaporn Pueraria capsules gave you a good result with bigger breasts. Once you reached a desired size, you should continue using Pueraria Mirifica, but at a much lower dose, for example 1 - 3 capsules per week, you have to see how your body reacts. A: The exact effect of Pueraria Mirifica on birthcontrol pills is not conclusive, please check with your MD before taking both Pueararia Mirifica and birth control pills. Q: I have 4 precise questions : -What are the caps made of? Here I mean the cap itself : is that cellulose? animal gelatin? which one? fish gelatin caps? - Is the material of the cap itself, for instance, let's say, fish gelatin, (not talking yet about the content), organic? - About the content now : is it extract or pure powder? This is not the same thing. -Finally, is there anything else in the cap than pueraria mirifica, and in that case, what exaclty? Thank you very much for your answers. A: Our capsules, ingredients and the whole manufacturing process are HALAL approved. The content of our Pueraria Mirifica is extract. There are supporting herbs in our capsules such as Piper Nigrum andBoesenbergia Rotunda. Q: Hi, i just made an order. How long does it usually take to process my order and send out for mailing? A: We are shipping every order within 24 hours except for orders received on Saturday, these will be shipped on Monday. Q: Hi do i just swallow the capsule? A: Pueraria Mirifica capsules can be taken with a glass of water. Q: Hello there, I have not receive the thanyaporn Pueraria Mirifica capsules which i ordered from you on 2/2/2015. I ordered 2 bottles. May i know how long does it takes to reach malaysia? A: Dear, typically shipping from Thailand to Malaysia takes 7 - 10 working days. We send all our packages with registered airmail. You can check with your tracking number at http://www.thailandpost.com. Hope you will get it soon. Q: Can a lady consume this if she is on contraceptive pill? A: The interaction between Pueraria Mirifica and birth control is not very clear and women report different results from taking the two together. Some result that the combination enhances breast size even more than when taking Pueraria Mirifica alone. Others claim the two together resulted in an irregular menstrual cycle, and it is not clear whether Pueraria Mirifica lowers the efficacy of the birth control pill. We would advise you to consult your MD before taking Pueraria Mirifica in combination with birth control. Q: hello..how to i oder thnyaporm..its still available? A: Yes, Thanyaporn Herbs products are available online at http://www.thaiherbalproducts as well as (limited range) in shopping malls throughout Thailand.